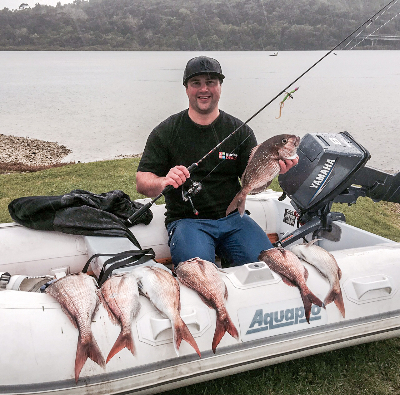 The first polyethylene (PE) ‘braid’ lines hit the New Zealand market back in 1993 and since then their fine-diameter-for-strength and very low-stretch characteristics have seen them adopted and adapted into almost every niche of fishing. In this time we have also seen a huge number of ‘next generation’ PE lines with more carrier strands, ‘fusion’-type braids, mixed aramid-fibres, braids with nylon cores – all manner of products as manufacturers jockey for position and attempt to improve the characteristics of knot strength, colour retention, abrasion resistance, cost and casting ability. Nylon monofilament line went through a similar development phase, too, after its introduction. A new PE line is significantly different to others on the market. 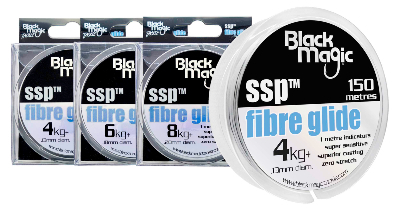 It has been released by Black Magic Tackle in New Zealand and is called SSP Fibre Glide. The SSP stands for ‘Single Strand Polyethylene’ and this describes the line well. Although technological details of the lines’ manufacture are being kept under the hat a bit, it has been termed a ‘mono-braid hybrid’ and is made from extruded high-modulus polyethylene fibres, combining many of the qualities of a monofilament and a braid. 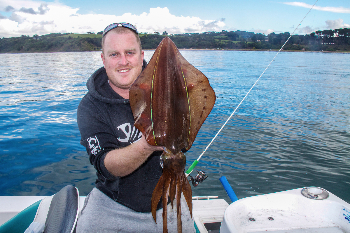 I have been fishing with the 6kg+ size of this product since mid-winter, mostly soft-baiting or stray-lining for snapper, gurnard and kahawai and the like with small eggbeater reels. Like a standard PE line it has very low stretch compared to nylon, and a much lower diameter for the same breaking strain. These are the main properties that have made PE lines so useful, but Fibre Glide also offers other advantages. Like nylon it is a ‘slick’ line with a modest memory. This means less friction through the guides (it is relatively quiet when casting and retrieving) and it ‘springs’ a little off the spool of an eggbeater when cast, further reducing friction on the spool lip. Result – I can cast it quite a bit further than a conventional ‘braid’ line. It also seems to pack better on the spool, resulting in less ‘catching’ of the line when casting or free-spooling. 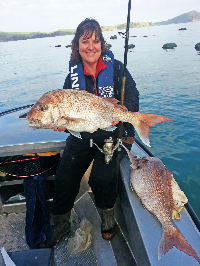 Nikki Stephensen with a 10lb and a 12lb snapper that she took off Long Bay in the Coromandel with the SSP 6kg+ line. Nikki says she was out for 2 hours before coming back home with her limit. Another plus is that it seems to be much more colour-fast than is often the case with PE lines. Fibre Glide is currently clear white in colour with a black marker stripe every metre. I find my aging eyes can see the line well when it is sitting on the surface or as a wind-belly in the air and the black markers allow me to see more easily when it is moving. This property aids in bite detection and sink control. I suspect that the black marks help break up the outline that fish may see under water. A further plus is the price. Machines can take around an hour to make 10 metres of braided PE line, but Fibre Glide can be extruded at a much faster rate, keeping the production costs down. 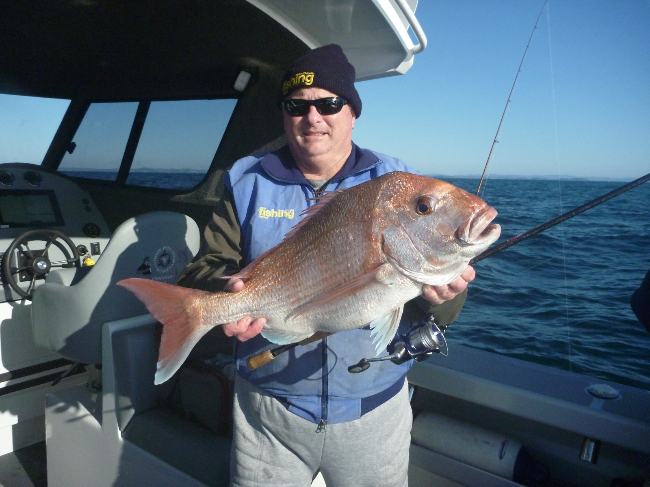 Antonio Guzzo from Marine Deals took these nice snapper using the 6kg+ SSP, noting that it casts 30% further than braid. As this line differs in construction to other braid lines it was going to be a fair bet that that the best knots to connect it to a leader might also be different. Black Magic allowed me to use the knot testing machine at their quality control and research facility to put some factual data together on this aspect. I decided to simulate my standard inshore soft-baiting rig by attaching 6kg+ Fibre Glide to a length of 10kg nylon Tough Trace. The first thing I found was that the 6kg+ line actually broke at an average of 9.97kg, hence the “+” in the line rating. This difference from the rating on the label is a standard thing for nearly all PE lines and reflects the fact that knotting PE lines often causes a considerable reduction in breaking strain. Having established a baseline, I worked through a series of knots and knot combinations to look for a dependable connection. Connecting single strands of SSP and nylon trace produced poor results. A 5-turn Surgeons Knot, for example, gave only 24% strength, while a 10-turn back-to-back Uni Knot was only 51% of the original SSP strength. I soon noticed that this line was quite slippery and required more turns than is usual in conventional braid, along with careful tightening, to create a strong join. I tried quite a number of standard braid knots (in series of six tests for each knot, averaged) and long story short, got the best results with a Bimini Twist in the SSP with a 15-turn version at 100%. I then used the double thickness formed in the SSP line by the 15-turn Bimini twist, to tie a ten-turn back-to-back Uni Knot with a single thickness of 10kg Tough Trace. This combination got me a line-leader connection that was 80% the strength of the unknotted SSP line, and at an average of about 8kg, was still considerably stronger than the labelled breaking strain of the SSP line at 6kg. 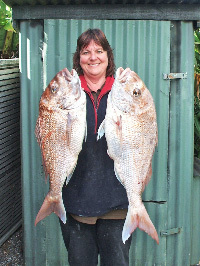 In real-life fishing situations the Single Strand Polyethylene (SSP) has stood up to some decent fish without failure. With this rig I fished through the second half of winter. Normally I would tie on a fresh leader for each trip, but in this case I left the same leader on for five trips to see how the knot and line would fare over time. 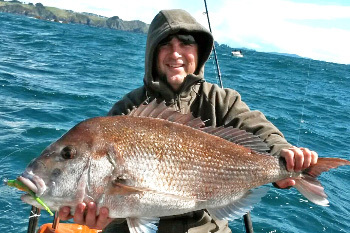 I caught around 40 reasonable fish on the same rig, the biggest a snapper of around six or seven kilos, and there was no failure of the connecting knot, even under some fairly solid drag settings, and also when trying to pull some badly ‘bogged’ lures out of the bottom.